f a boater has an emergency on the water, there’s no better way to call for help than with a Digital Selective Calling (DSC) VHF radio which can give rescuers critical GPS location information. 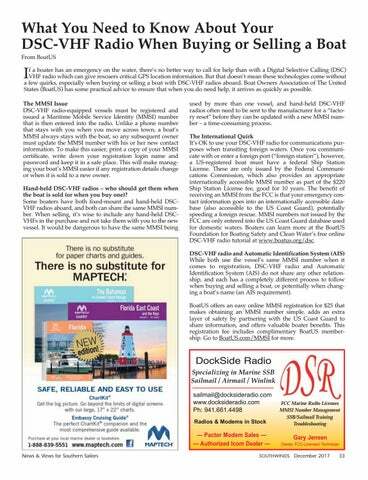 But that doesn’t mean these technologies come without a few quirks, especially when buying or selling a boat with DSC-VHF radios aboard. 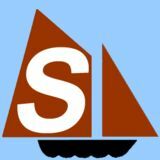 Boat Owners Association of The United States (BoatUS) has some practical advice to ensure that when you do need help, it arrives as quickly as possible. used by more than one vessel, and hand-held DSC-VHF radios often need to be sent to the manufacturer for a “factory reset” before they can be updated with a new MMSI number – a time-consuming process. The International Quirk It’s OK to use your DSC-VHF radio for communications purposes when transiting foreign waters. Once you communicate with or enter a foreign port (“foreign station”), however, a US-registered boat must have a federal Ship Station License. These are only issued by the Federal Communications Commission, which also provides an appropriate internationally accessible MMSI number as part of the $220 Ship Station License fee, good for 10 years. The benefit of receiving an MMSI from the FCC is that your emergency contact information goes into an internationally accessible database (also accessible to the US Coast Guard), potentially speeding a foreign rescue. MMSI numbers not issued by the FCC are only entered into the US Coast Guard database used for domestic waters. Boaters can learn more at the BoatUS Foundation for Boating Safety and Clean Water’s free online DSC-VHF radio tutorial at www.boatus.org/dsc. DSC-VHF radio and Automatic Identification System (AIS) While both use the vessel’s same MMSI number when it comes to registration, DSC-VHF radio and Automatic Identification System (AIS) do not share any other relationship, and each has a completely different process to follow when buying and selling a boat, or potentially when changing a boat’s name (an AIS requirement). BoatUS offers an easy online MMSI registration for $25 that makes obtaining an MMSI number simple, adds an extra layer of safety by partnering with the US Coast Guard to share information, and offers valuable boater benefits. This registration fee includes complimentary BoatUS membership. Go to BoatUS.com/MMSI for more.